Having the center channel speaker positioned correctly is critical for an effective home theater setup. This speaker is really the workhorse in your system and it gets used more than any other speaker when watching movies or TV. Making sure this speaker has the right home can make or break your listening experience. The term “crossover” gets thrown around a lot in the audio community, but there always seems to be some confusion when it comes to this subject. 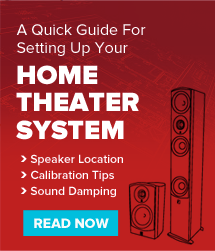 We get a lot of inquiries on the matter here at Aperion, so here is a beginner’s primer on what this essential component of a speaker system does.